Does all İznik pottery come from İznik? Yes. Iznik is in fact the name of a town previously known as Nicaea which lies some 90 kilometres southeast of Istanbul, and was the site of the potteries of the Ottoman Empire. A group of Iznik ceramics, purchased between 1865 and 1878 on the Greek Island of Rhodes by the Cluny Museum in Paris, led to a lasting misattribution of these wares to the island. Indeed, some of the earliest examples of Iznik sold at Christie's in the 19th century and early 20th century were catalogued ‘Rhodian’! Excavations of the kilns at Iznik have since righted this misattribution, but many older publications will still refer to Rhodian ceramics. What sorts of objects were produced? Are any rarer than others? Iznik vessels of all shapes and sizes were produced — for eating and serving food, and for functions relating to religious worship. Of these, dishes, followed by jugs, are the most commonly found. Other forms occasionally come up for auction, but are rarer. Tiles were also produced in great quantities — particularly in the second half of the 16th century, as decoration for the walls of the monumental structures being commissioned by the Sultans of the era. The tiles we see coming to market are likely to have been the surplus of this large-scale production. What’s the difference between 15th, 16th and 17th-century pieces? Iznik can be dated quite precisely, largely on the basis of the colours and designs of specific works. Sixteenth-century pieces are generally more coveted than those made in the 17th century. Because Iznik was produced in relatively large quantity, condition plays a big part in value. Intact pieces can make significantly more than similar examples with repaired breaks. If a piece is repaired, the less loss of the original body, the better. Often you will find small holes in the foot of a dish, drilled so that it could be hung. Don’t worry about these, they won’t affect the value. Good Iznik has strong colours well-contained within their outlines and a very clean, clear white. The red colour, made with Armenian bole (an earthy clay) should be thick and proud of the surface. Beware! Photographs can often misrepresent colours, particularly the white which is so crucial — ask for further images which may be taken in different light or, ideally, go and see a piece in person. Ask questions about a piece’s history before you buy. A known or old collection can add to the attraction of a piece. Stickers or numbers on the underside of a piece often hold clues to the history. These old stickers on the back of a lot in our April King Street sale meant that we could trace its history all the way back to an auction it was included in in Paris in March 1919. Look out for 19th-century European interpretations of Iznik. In the 19th century a trend for collecting Islamic works of art developed which in turn also became a source of inspiration for European craftsmen. Iznik pottery was one of the types that was most frequently ‘copied’ by makers such as Samson, Theodore Deck and Cantagalli. Look at pieces closely: most of these makers signed the base of their works — Cantagalli usually with a small cockerel, Deck with a THˑDECK and Samson with a playful variety of takes on the letter ‘s’ or it’s equivalent in Arabic. Also highly collectable is Kutahya pottery, which was produced from the 15th century in a town close to Iznik. Production peaked when Iznik declined, and it is still produced today. 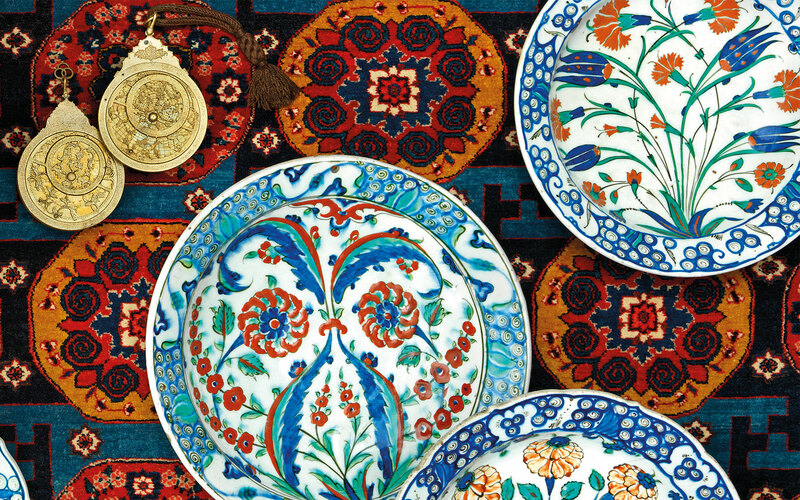 Its wares are characteristically decorated in bright colours, including yellows and browns not familiar in Iznik. Kutahya had a large Armenian community, so the pottery produced there often incorporates Christian motifs. Because Iznik has been so widely admired and collected almost since the time of its conception, examples can be found in museums the world over. In London the British Museum hosts what is perhaps one of the best collections outside Turkey, with many examples that have really formed our understanding of the group. If you are lucky enough to travel to Istanbul, the Çinili Köşk (literally tiled kiosk) in the Topkapi Museum is well worth a visit. So too are the Sadberk Hanim Museum and my personal favourite, the Mosque of Rüstem Pasha, where a magnificent array of different tile designs beautifully demonstrate the mastery of the Ottoman potters.